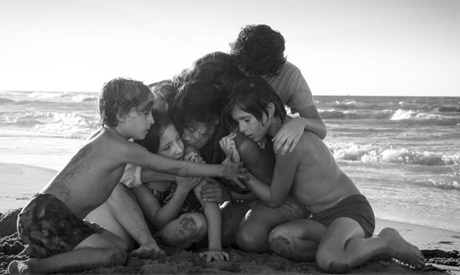 The Los Angeles Film Critics Association on Sunday named Alfonso Cuaron's deeply personal drama ``Roma'' best film of the year, adding to the acclaimed film's steadily mounting honors. Cuaron's black-and-white film, a Netflix release, has been cleaning up many of the top prizes of awards season. It won the Golden Lion at the Venice Film Festival and likewise topped the New York Film Critics Circle. ``Roma'' is widely expected to land Netflix its first best-picture nomination at the Academy Awards. Critics groups can influence the larger Oscars race, which has thus far struggled to elevate a likely female filmmaker contender, a sore point for some considering the wealth of options (including Chloe Zhao for ``The Rider'' and Marielle Heller for ``Can You Ever Forgive Me?'') and the historic male dominance of the category. On Thursday, the Golden Globes named an all-male field of directing nominees for the fourth time in a row, a record that has drawn increasing criticism. The LA critics named Olivia Colman ("The Favourite'') best actress and Ethan Hawke ("First Reformed'') best actor. Hawke was also the New York critics' choice and the winner at last month's Gotham Film Awards. The critics also named Sandi Tan's ``Shirkers'' best documentary, the upcoming comic-book adaptation ``Spider-Man: Into the Spider-Verse'' best animated film and Nicole Holofcener and Jeff Whitty's script to ``Can You Ever Forgive Me?'' best screenplay. Other winners included Nicholas Britell for his score to ``If Beale Street Could Talk,'' Hannah Beachler for the production design on ``Black Panther'' and Joshua Altman and Bing Liu for editing ``Minding the Gap,'' the documentary about friends in a small Rust Belt town in Illinois. The critics will hand out their awards in a ceremony on Jan. 12. They will also honor Japanese filmmaker and animator Hayao Miyazaki _ co-founder of Studio Ghibli and the maker of animated classics like ``Howls Moving Castle'' and ``My Neighbor Totoro'' _ with their career achievement award.